I am a web dev and competent in Fireworks, but not so much in Photoshop. I have just received a layered PSD file to turn into a web page. Can anyone tell me the easiest way to export all layers to individual png files? There are lots of layers and doing this manually seems wrong. I have seen this but it does seem there should be native functionality for this in PS. I have access to Photoshop CS4. Any pointers appreciated. This question came from our site for professional, enthusiast and amateur photographers. I spent some time and wrote my own script file to automate this process. This process is much faster than the built-in script mentioned above. Get the script now on Github! I ran this script on a 100 layer, 450MB file in under 60 seconds. Running the built-in script on the same file takes me about 30 minutes. When testing with nest layer groups, I found that my script runs in about 90 seconds whereas the built-in script takes about 27 minutes (and actually exports it wrong). Please note that these results will vary depending on the complexities of the files as well as the hardware on your computer and the version of Photoshop. Additional performance data. This script has (over the past few years) gotten various improvements from various contributors. If you run into any issues with the script. You can files issues with the script here. Please read through the read-me for any additional, additional information. Disclaimer: This script is not associated with Adobe in any way. Please use script at your own risk -- always make a back-up of your PSD before using. I am not responsible for any damaged or lost data. Layer groups are now properly handled so that all layers get written. File names are auto-incremented to prevent collisions (this happens when more than one layer has the same name). Performance is increased. The script can save 500 simple layers in a few minutes. Besides this, the code has been cleaned up. For example, global variables have been integrated into a single array. 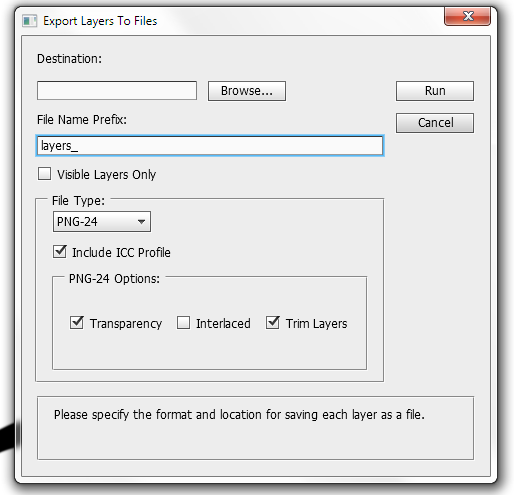 Note that the initial popup message will only tell you the number of top level layers. This is to avoid performance degradation. I can't really imagine a case where you don't know anything about the file you are dealing with, so this should not be much of a compromise. Grab the script here. Thanks to the previous author for leading the way. CREDIT GOES TO JOHANNES FOR CONTRIBUTING THE FILE. THANK YOU SO MUCH! I have added a function that helped me go through my 2448 layer file in about 3 hours. I updated the script to use the core BackgroundLayer of the doc. So that each jpg that exports is compiled with it. //  Saves each layer in the active document to a PNG or JPG file named after the layer. //  These files will be created in the current document folder (same as working PSD). Not the answer you're looking for? Browse other questions tagged adobe-photoshop layers export png batch-processing or ask your own question. Is there a faster way to save all layers in PSD to PNG?